DETAILS: Men's personalized Irish t-shirts are here! Select from several original designs for his custom t-shirts celebrating his Irish heritage or just for celebrating the St. Patty's Day holiday! T shirt is made with a 50/50 cotton and polyester blend. PERSONALIZATION : Select Image (6 images to choose from) and personalize up to 10 characters (see design). 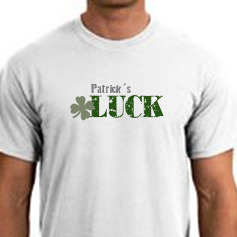 MARKETING : St. Patrick's Day, Irish guy and is perfect gift for the Irish wanna-be on your list!